Be the first to share your favorite memory, photo or story of Tyler. This memorial page is dedicated for family, friends and future generations to celebrate the life of their loved one. 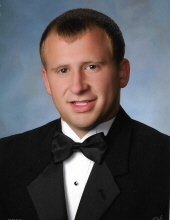 Tyler was a 2011 graduate of William Tennent High School. He was an avid sports fan who also enjoyed music, fishing, hunting, and spending time with his son and family. He was a true inspiration and loved by all. He had a smile that could light up an entire stadium and a laugh that touched people’s hearts for miles and miles. He had a heart of gold and would do anything for anyone. He was generous, loving, and thoughtful. Tyler would have encouraged anyone facing similar battles to reach out for treatment and help. Know you are loved and your battle isn’t over yet. He is survived by his mother, Rosemarie Such; father Harley Raymond Strauss, III; step mother Suzannne Strauss; sister Brianna Lynn Strauss; brother-in-law Andrea Illiano; son Jaxen Jarrett Strauss; fiancé, Cassidy Lynne Miller; longtime family friend Erna MacMillan; his grandparents, Nancy Bocchino and Harley Raymond Strauss, Jr and Rosemarie and Ihor Buta and many cousins, aunts and uncles. He was pre-deceased by his maternal grandparents, Rose and Andy Such. The family will greet relatives and friends from 5:30 to 7:30 pm, Thursday December 6, 2018 in Baskwill Funeral Home, 20 W. Montgomery Ave, (half block west of York Rd) Hatboro, where his memorial service will begin at 7:30 pm. In leiu of flowers, the family asks for donations to: Jaxen Strauss, c/o PNC Bank, 521 North York Road, Warminster, PA 18974. Please feel free to join us Thursday after his viewing at 8:30 pm at the Warminster Heights Community Center, 75 Downey Drive, Warminster, PA for a celebration of life get together. To send flowers or a remembrance gift to the family of Tyler Jarrett Strauss, please visit our Tribute Store. Visitation is from 5:30 to 7:30 pm, Thursday December 6, 2018; memorial begins at 7:30 pm. "Email Address" would like to share the life celebration of Tyler Jarrett Strauss. Click on the "link" to go to share a favorite memory or leave a condolence message for the family.